Invisalign is a great tool for straightening teeth and ensuring crooked teeth are realigned over time. One of the challenges Invisalign user’s face as they try to work with the product on an everyday basis is that they find it difficult to clean their teeth. To help resolve this issue, we’re highlighting five tips for cleaning teeth for Invisalign users. Invisalign wearers must take their braces off for meals, and so this is the ideal opportunity for them to clean their teeth and remove any contaminants that have become stuck during the meal. Rather than putting their aligners back on immediately after they eat, Invisalign wearers can quickly brush their teeth and then ensure that bacteria and other elements are removed before they place them back on. Oftentimes users don’t have time directly after meals to complete a comprehensive clean. But to prevent staining and ensure contaminants are at least partly removed, they can simply rinse their teeth with water after they eat or drink. This is particularly important after drinking items with staining properties such as coffee, which can darken teeth over time. Rinsing will prevent the elements within the coffee from sticking to the enamel. While wearing bracing products such as Invisalign, it’s exceptionally important to maintain an oral health care regimen. That’s why Invisalign users should speak with their dentist and arrange appointments with them on a regular basis. The dentist can check the condition of the teeth and ensure that there are no issues that have arisen as a result of a change within the oral care process during the Invisalign treatment. 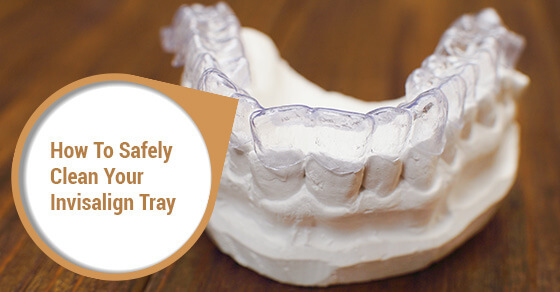 Over time, a person’s aligners will pick up germs and other environmental contaminants. This could occur as a result of drinking fluids while wearing the aligners or simply due to the bacteria within the surrounding environment. That’s why it’s important for Invisalign wearers to clean their aligners regularly with antibacterial soap. This will help to ensure the product remains clean throughout the period of treatment. When undergoing Invisalign treatment, it’s essential to commit to flossing on a regular basis. The smallest contaminants can cause lasting oral health issues, so simply taking ten minutes a day to floss can help make sure Invisalign users achieve the ideal results from their braces. To learn more on your Invisalign cleaning requirements, speak with our trusted oral health specialists directly. Experts are standing-by to answer your questions! Invisalign is a popular alternative to traditional braces. This treatment is designed to mitigate the impact of braces in your day-to-day life and allow you to achieve transformative results in a shorter space of time compared to traditional orthodontic options.